This painting Yarn Bomb Tree was inspired by the trees in Austin who have been lovingly covered in colorful, knitted yarn. 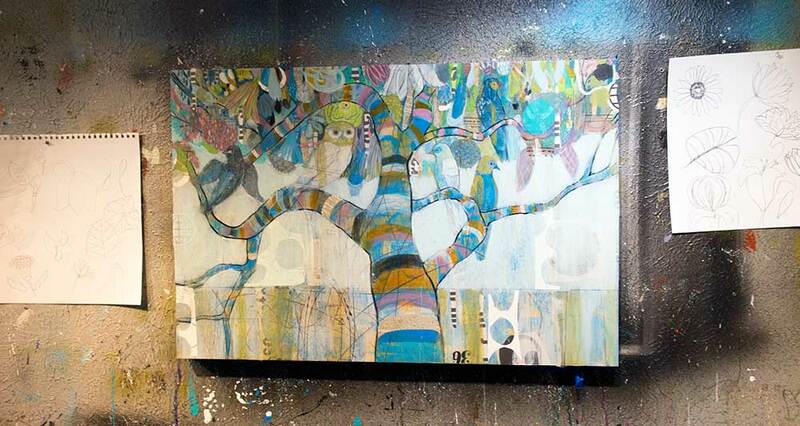 These photos illustrate the transformation of this particular painting with process shots. The final result is found at the bottom of this post, or on Judy’s website. One of my very favorite things about working for Judy is the exposure to new things – nature spots, new forms of exercise, unique restaurants, new ways of art-making, avant-garde design & technology. It’s not these “things” themselves that inspire me, but instead Judy’s constant curiosity. I used to think art-making was about forcing yourself to labor over a canvas, almost like punishment, until something groundbreaking came charging out. I still think that kind of dedication has a time and a place, but what I’ve found to be equally important is taking time to relax, to see new things, and to DO new things that won’t make sense until they’re tried. Otherwise, what story will your art tell? Did you know Judy’s a boxer, a mom, a runner, a nature hiker, a yogi, a techie, and one of the most productive artists I know? The latter identity, I believe, is directly linked to her passion for life and discovery. 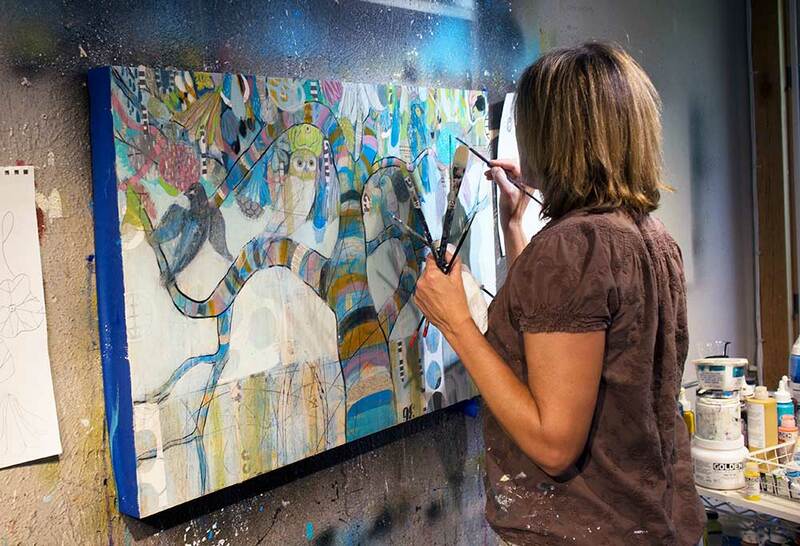 Her studio is as much one of a painter’s as it is one of a scientist’s. In other words, there’s a lot of experimenting with chemicals and machine-hacking going on! Sometimes it’s just to see what will happen, and the best parts often end up in her paintings. 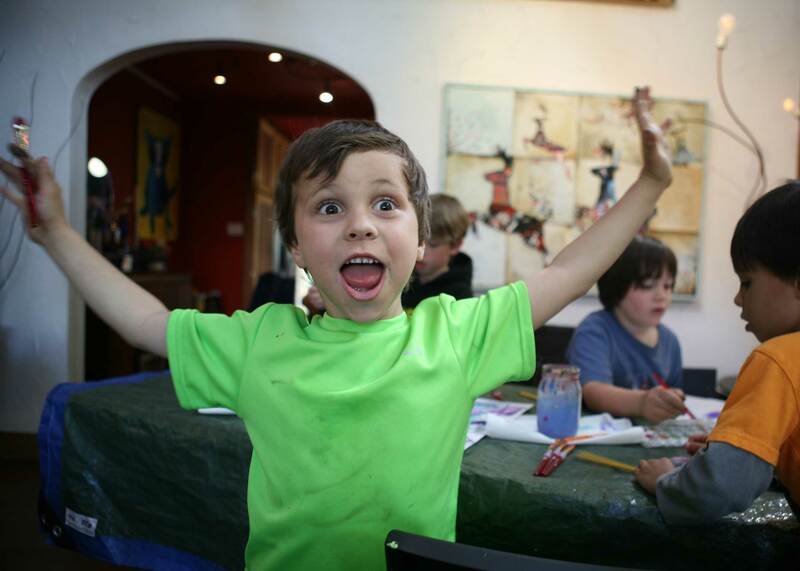 So, to live an artful life, no matter your occupation, stay curious. 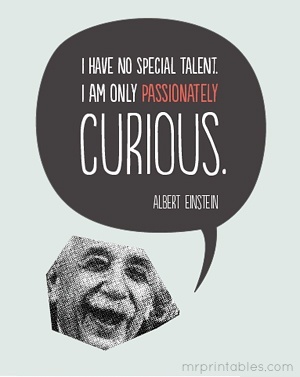 Ol’ Einstein himself even credits curiosity to his genius. Lately, quick-draw sessions have been effective elements in Judy’s artistic recipe. Here’s what this process looks like. Follow along, and find out how you can have the finished product FREE! 1. Choose a simple subject. Take a photo, or use good old Google Image Search. 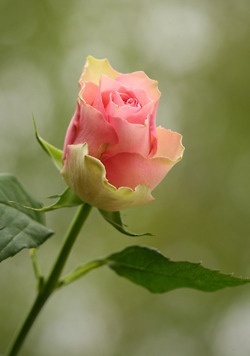 Judy chose roses because they’re her mom’s favorite, and Mother’s Day is this Sunday. This found photo would make a great reference! Judy folds plain old computer paper in half x2 to create four “boxes” to draw inside of. 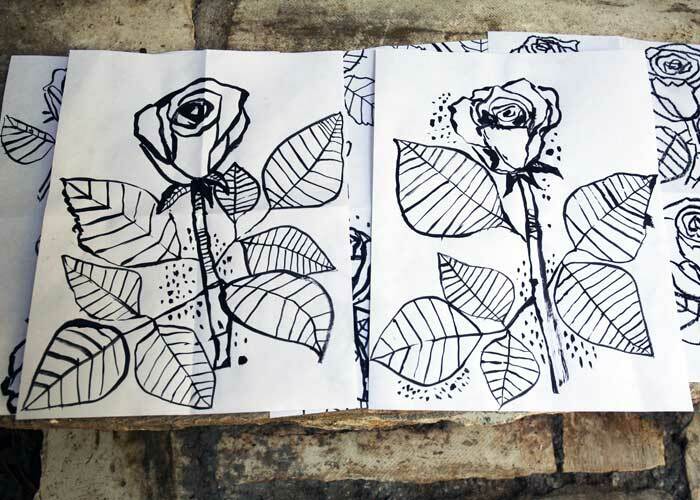 Her drawing tools vary from an oil pastel, crayola marker, or a paintbrush with India ink. Whichever medium you prefer, use black for this step. And draw some more. 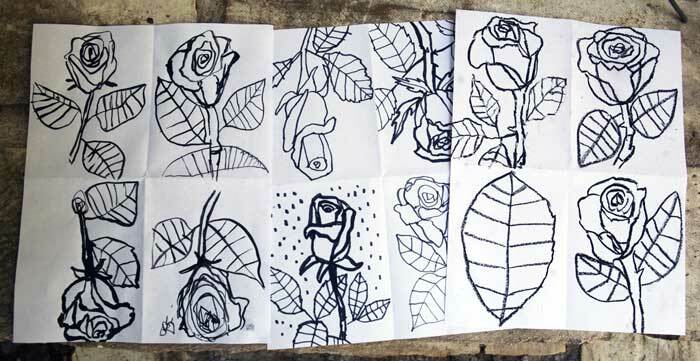 In this example, Judy quickly made 4 line-drawings of a rose. Be loose. Don’t strive for perfection or too much detail here. If you want, keep going on multiple sheets, or try filling up a full sheet! 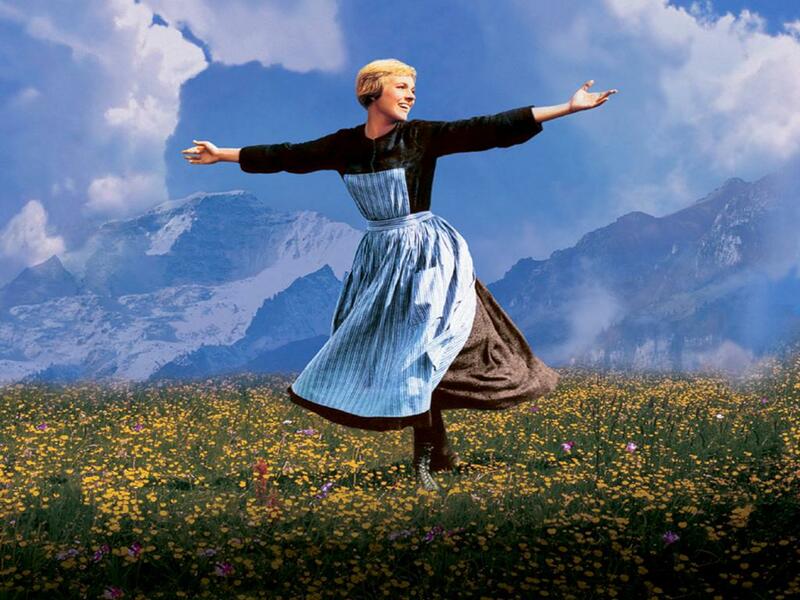 Once a favorite is chosen, it can become a painting, a t-shirt design, you name it! 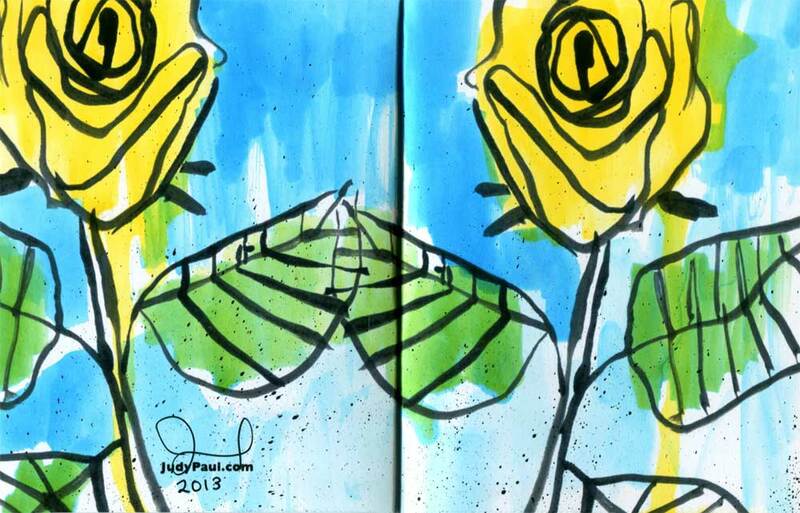 Judy scanned her favorite drawing, and printed that image onto multiple greeting cards. 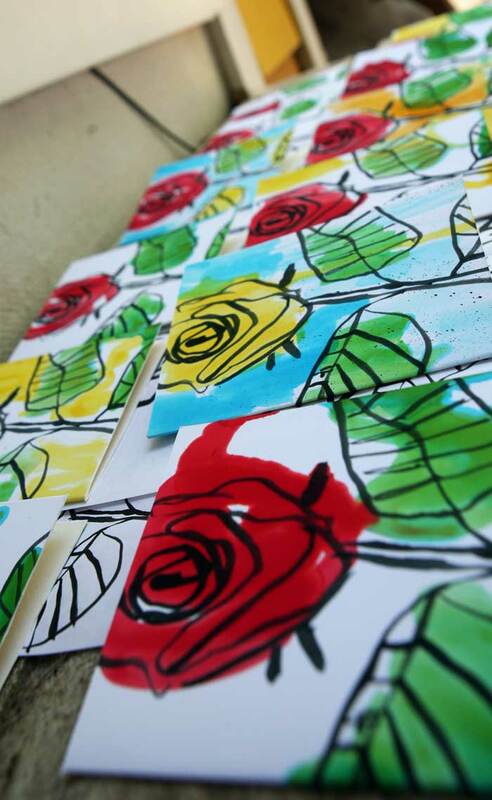 Then, she added water color on top of the black-and-white print to make a series of hand-painted greeting cards. 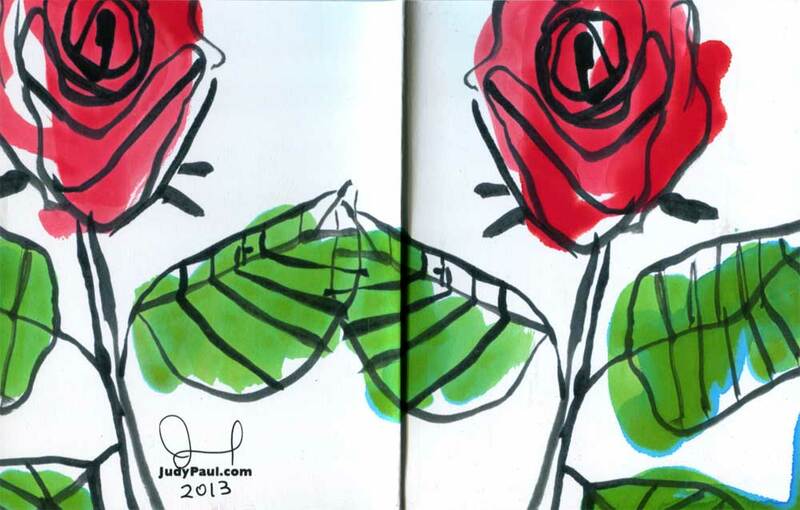 For Mother’s Day, Judy is sending one card to her mom, but she’s also sharing them with YOU! Today, you are invited to come to her home and pick one up to send to your mom. Each one is complete with an envelope, and and Judy’s signature on the back. Lovely. 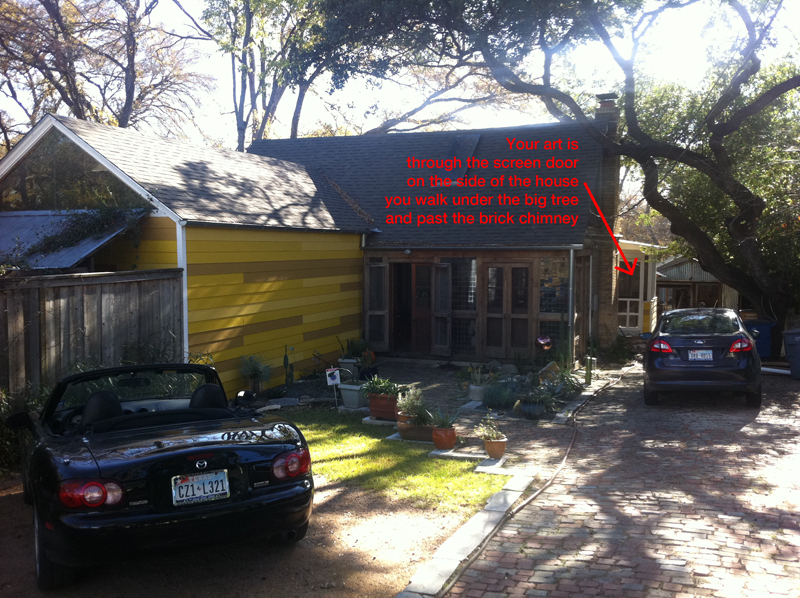 Judy’s home studio is at 2205 Bridle Path, Austin, TX 78703. A card is waiting for you on her screened-in porch (TODAY ONLY). The door is open, come on in. Please take only one. 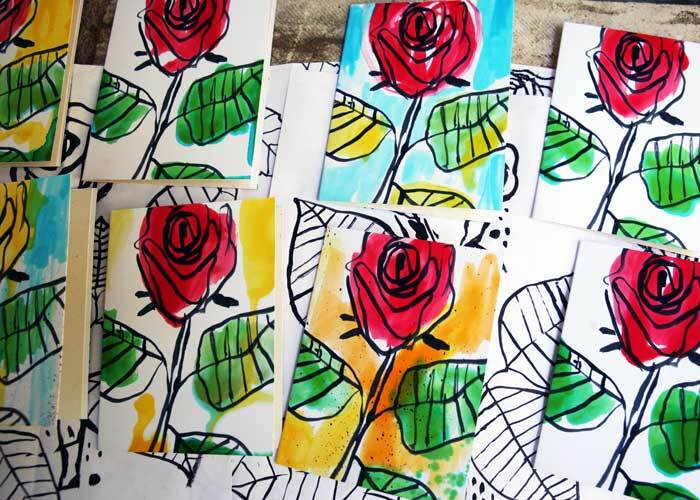 Follow these directions to find your hand-made card. I hope you enjoy, create, and pass it on. 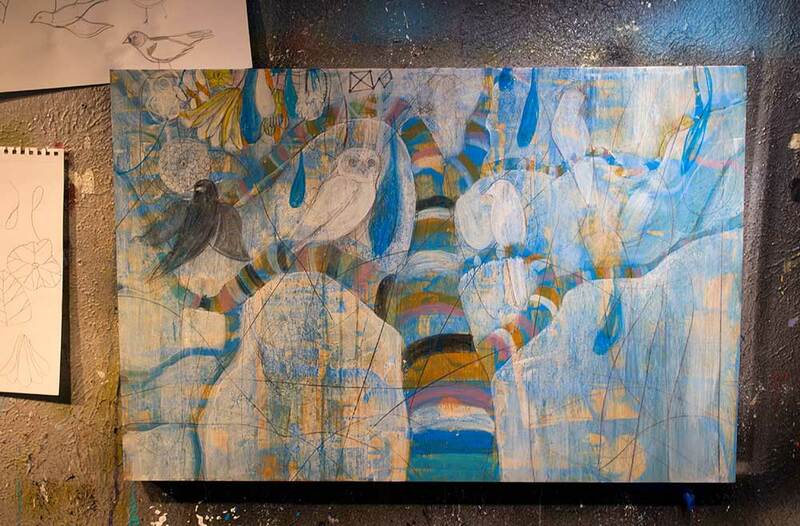 Two new paintings, in progress. Progress detail of Judy’s painting. Judy preparing to screen-print on her paintings. We made beetle art! 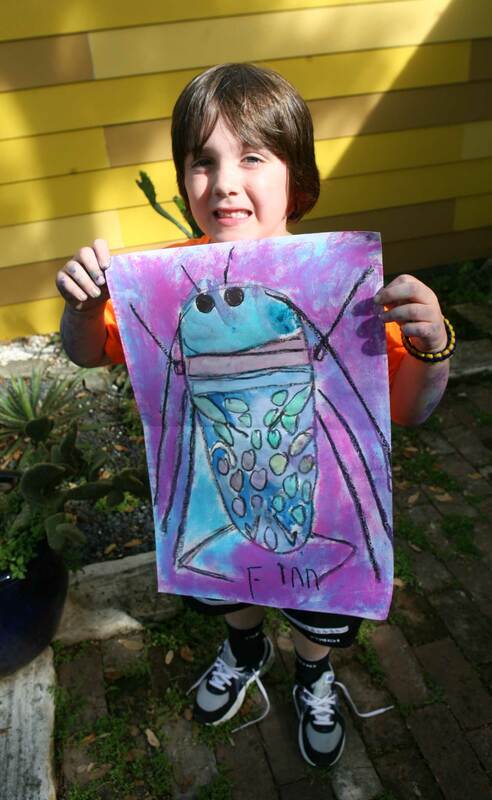 Beginning with a black oil pastel line drawing, a chalk pastel background, and watercolor for the body, these kids came up with some beautiful, jewely bugs. Collaboration is a big deal in Blue J Art Club. 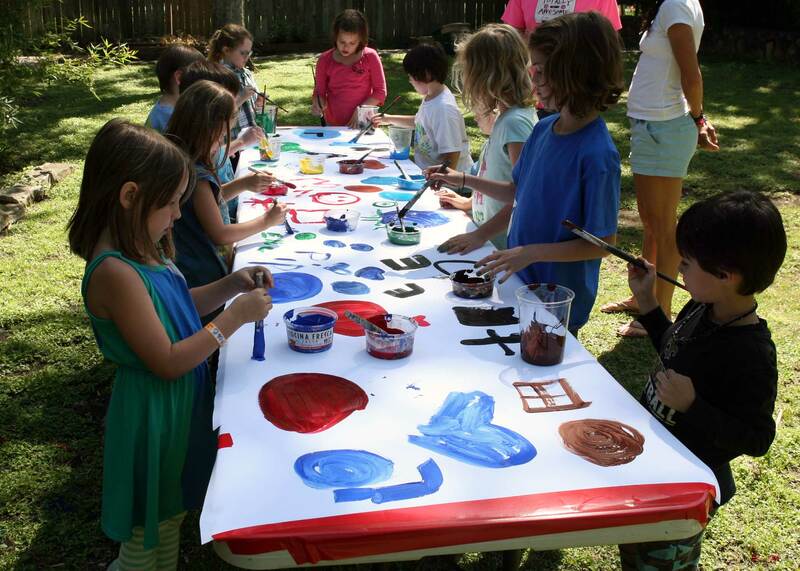 The kids did a giant, loose painting that we used for a later project. 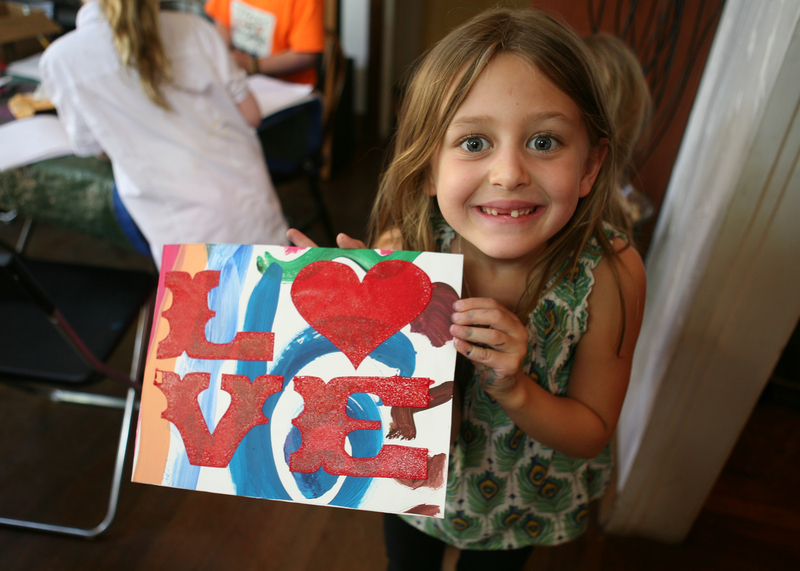 After the kids finished the mural, Judy had the idea to cut up the mural and help the kids screen-print “LOVE” on top. Great Mother’s Day gift! 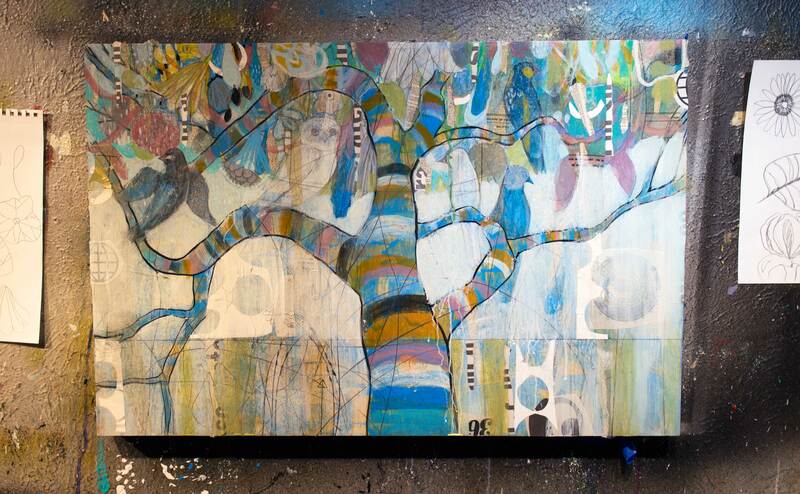 Looking at a neat finished painting can easily make us think that of art-making as pure creative joy. A time when a person frees themselves of all that binds them, skipping merrily through a figurative field of flowers with a paintbrush made of rainbows. Part of what makes her successful is her persistence to keep going through the uncertainty, allowing it to push her where she wouldn’t have gone if she had stayed comfortable. There is a level of fear in painting, but she paints anyway. By not seeing failure as means to an end, but as a necessary ingredient to a breakthrough, she keeps on making surprising work. The process may not be a field of daisies the whole way, but by not throwing down her paintbrushes, Judy usually ends up in the wildflowers.